THE MAD DOCTOR bent over the young reddish-blond-haired girl strapped to his table. His scalpel glinted dangerously in the harsh glow from the overhead lights in the operating room. “You’ll bother me no more!” he said with an evil cackle. He lifted his hand high above her chest, ready to plunge the knife in. “By the music, Bess. It’s definitely hero music,” Nancy answered. “Why can’t she save herself?” asked George Fayne, Bess’s cousin and one of Nancy’s best friends. “Because she’s trapped with a maniac!” declared Bess, flipping her blond hair behind her ears. At that moment the movie’s hero threw open the door to the operating room and wrestled the doctor for the scalpel. The scalpel clattered to the floor, and the villainous doctor staggered toward the door. The heroine’s eyes fluttered open. The three friends were seated in the Drews’ den, eating popcorn and spending a quiet Saturday night at home. 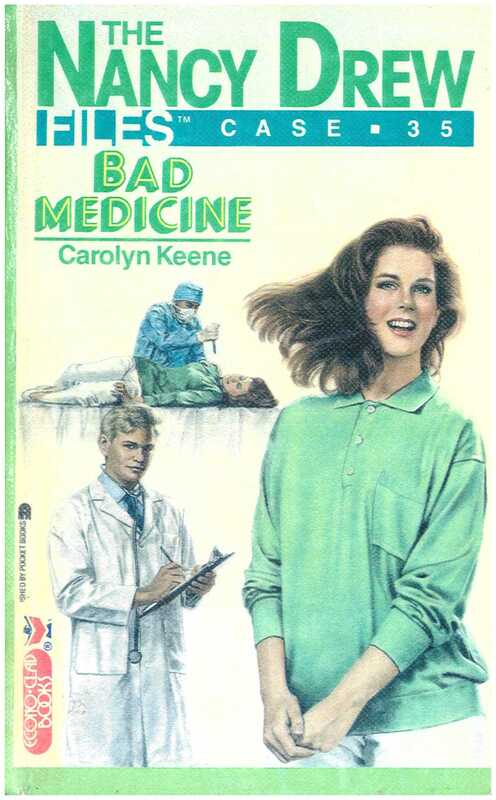 “Since when are you interested in medical thrillers?” Bess asked as Nancy rewound the videotape. “I don’t know, but I hope so. I’m seeing him tomorrow night before the seminar starts, but I think he’ll be pretty busy after that. His friend Trevor Callahan is a second-year resident at the school and hospital here, and I know Ned wants to spend time with him.” Nancy hit the eject button, and the tape popped out of the machine. Nancy walked Bess and George to the door, then locked up the house and climbed into bed, folding her arms under her head. She was eager for Sunday to come and for Ned to start his seminar. “Trevor or no Trevor, you’re going to spend some time with me, Ned Nickerson,” Nancy said, staring up at the dark ceiling with a smile on her face. “Are you sure you want to get involved in hospital administration?” Nancy asked Ned as she pulled against her seat belt to look out the windshield. She was peering through the early-evening shadows, trying to get a good look at the prestigious medical school. The hospital, a huge gray stone building, stood in the forefront of the campus. A smaller building flanked it on the south. The dorms were clustered around the parking lot, and farther back, across a grassy parkway, stood an older ivy-covered brick building. Ned laughed. “Nurse Nancy, eh?” He tousled her reddish blond hair affectionately. Nancy knew very little about Trevor except what Ned had told her. She knew he was specializing in cardiology, hoping to be a heart surgeon soon. They waited in the car, but twenty minutes after they were supposed to meet, there was no sign of either Trevor or his fiancée. Eventually an attractive girl with blunt-cut shoulder-length brown hair pushed through the front doors of the dorm. She wore a blue dress, and what looked like a lab coat was tucked under one arm. She hesitated on the brightly lit stairs, peering through the covered walkway. “Do you think that could be April?” Nancy asked. Nancy opened her door and walked around the front of the car to meet April, who looked about twenty-three or -four. Though the evening was warm, her arms were wrapped around her waist, as if she felt cold. She kept glancing over her shoulder at the hospital building. “This is my girlfriend, Nancy Drew,” Ned said, introducing them. April smiled faintly. “I’m in my third year of medical school. I won’t be a full-fledged doctor until I’m finished, but we address one another as doctor as soon as we’re admitted to medical school.” She threw another look at the imposing gray building. “Do you want to go to the hospital?” Nancy asked. “Oh, I’m sorry,” Nancy murmured. Her heart went out to April. “He does have a heart condition,” April admitted. The hospital’s main lobby was decorated in cool tones of gray and white. Several sofas were grouped around a rectangular glass table, and several magazines were fanned across the table’s glossy surface. The reception hub took up the center of the room. Two women sat behind it, one greeting visitors and the other working the switchboard. Nancy glanced at Ned. She didn’t see how they could leave the hospital and go out to dinner. April was too upset. “Maybe we could eat in the hospital cafeteria,” Nancy suggested out loud. “April might want to stay at the hospital,” Nancy pointed out, nudging him in the ribs. Nancy and Ned exchanged glances. They didn’t want to get in the way of an emergency. But April had already ushered them to an elevator. “The room’s in the west wing,” April said as they stepped off the elevator into a gleaming corridor. A blond man in a doctor’s coat was just pushing open the door to Room 755 when Nancy, Ned, and April approached. “There’s Trevor now,” April said, rushing forward. Intent on his task, Trevor disappeared into the room. Nancy stood by the open door. Inside the room, someone was gasping wildly. Alarmed, Nancy caught a clear glimpse of a middle-aged woman lying in bed, her face swollen and contorted, her fingers clutching at her throat. But instead of helping her, Trevor just stood at the foot of the hospital bed, staring. Nancy was horrified. He was going to let her die!